After two hours of indulgence, I broke into the Nevada sunlight, the owner of a Blues Bender harmonica and a Hoodoo Wireless Harmonica Microphone System (review to follow), both Hohner products. The time lapse was not owing to crippling indecision amidst an endless and tantalising selection of harps by the way. Au contraire – there were less than a sorry handful of models perched at one end of the effects pedal counter. Nor was it the result of the Blues Bender’s beguiling musical properties. It was simply because the salesman (a punk bassist outside office hours) allowed me to roam the store hooked up to a Fender Twin Reverb amp via the Hoodoo radio mic, blowing my own Steve Weston custom Marine Band! Wandering Wilf’s the name, terrorising innocent shoppers and adolescent rock guitar wannabes is the game. I was as happy as a pig in fertiliser. A small selection of Blues Benders were hanging in Hohner’s new ‘blister’ packs above the counter, their accompanying display pegs making the new harps very eyecatching. ( Hohner are using this style of presentation for their other models too – Special 20s and Big Rivers were packaged the same way). You might imagine from this harp’s name that Hohner’s experts have somehow harnessed the secrets of successful note bending – perhaps the most essential foundation to good blues harping. You’d be mistaken. There’s no such thing. 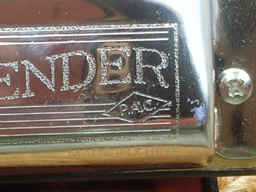 Even Hohner’s ‘revolutionary’ XB-40 house brick, the harmonica ‘that allows for the bending of every note, whether blown or drawn’, requires use of ‘standard bending technique.’ Hohner tell us so. 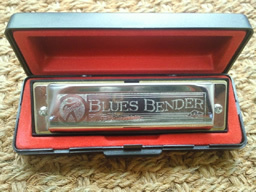 The Blues Bender name is more a pitch at the enduring market for budding blues harp players; although I accept they have adopted some design modifications that help eliminate air seepage. I am mystified by the two words at the bottom of the Blues Bender’s packaging however, ‘Just breathe.’ The cynic in my head is screaming, ‘As opposed to what – add water?’ Isn’t this advice true of any harmonica? I sometimes hear myself preaching it to beginners as they struggle with their first draws in holes 2 and 3. Maybe the inference is that this model responds more readily than others. Again I suspect there’s no such thing for a complete beginner. We all have to learn embouchure and basic playing techniques. But this harp does sing nicely and is not leaky like other models. I also accept some harp models need breaking in. Or else they are so cheaply manufactured they should be awarded their own dangerous goods category. But such models are heavily outnumbered by affordable, ‘performance ready’ ones (with wooden, plastic and alloy combs). So what makes the Blues Bender any different? Hohner’s packaging lists four key features. The start of point three is, I think, genuine. I choose to interprate this as ‘more airtight than other budget harmonicas’. But beware Hohner, there is a real danger this puts question marks over the airtightness of your own more expensive alternatives. 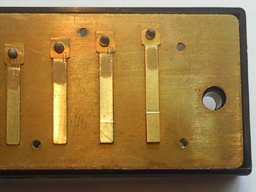 The Blues Bender’s reed plates are secured by nine Phillips screws. 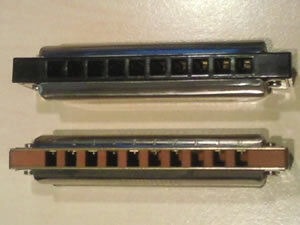 Standard Hohner and Lee Oskar models have three. The plates themselves are countersunk within rims around the top and bottom surfaces of the comb, much like Lee Oskar or hand made Special 20 plates. Which marks a significant change in design for Hohner. Hitherto the front edge of their reed plates have been visible between the comb and cover plates – at least on their MS range. Theory and good common sense would suggest the Blues Bender design is therefore more airtight. Once again it would be interesting to see (or hear) scientific evidence. As to the claim of longer lasting reeds. Surely this is relative to the treatment of the instrument (to the force and frequency of its use) unless a new metal alloy or production technique has been discovered. Again, and unless anyone has scientific proof that Blues Bender reeds are superior to other reeds, I choose to interpret this as, ‘compared with other budget harmonicas’. In which case harp players will be snapping up lorry loads of the things. Cue the sound of stampeding feet. Finally, I want to pick up on the Blues reference in the model’s name and on the packaging. Blues is a feeling. Blues is a scale. Blues is a style. I accept that blues harmonica playing requires bends, but let’s stop right there. So does Country, Pop, Rock, Cajun, Celtic and any style using 2nd or 3rd, or even 1st position. The Blues Bender might be more sympathetic to the aspirant blues player if it offers up bends more readily, but I don’t believe this harmonica will fast track you to the blues itself. A few years of studying might. Billy Branch was laughed out of Chicago by the incumbent harmonica heirarchy because he’d been playing blues harmonica for less than five years. Over the years, several students have arrived for their first session at the Harp Surgery carrying a Hohner Great Little Harp (GLH). This is an ‘entry-level’ forerunner of the Blues Bender, often marketed with a tutorial video or book. Indiviual GLH’s can be bought on line for half the price of the Blues Bender. My students seem to find the GLH very comfortable and responsive. The Blues Bender is marginally chunkier than the GLH, but only by a whisker. The overall dimensions are almost identical. The Blues Bender’s cover plates sit more proud at the back than the GLH. The GLH uses slotted crew heads and, being an older model, the cover plate fixings are ‘nut and bolt’ rather than the contemporary countersunk phillips screws. 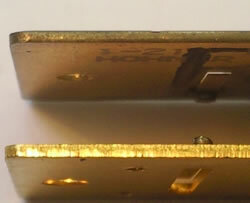 Inside, the GLH uses eight slotted screws to secure the reed plate to the plastic comb, compared with the Blues Bender’s nine. 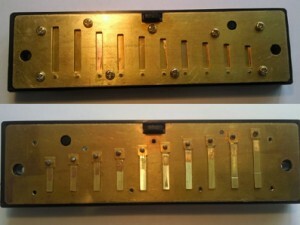 The GLH reed plates are certainly thinner than the Blues Bender. I will stick my neck out and say that the GLH may well have been used as a direct reference model when developing the Blues Bender. So what makes the Blues Bender a good buy? Forget what it says on the packaging. It’s just Hohner’s marketing team earning their daily bread. ‘PAC’ is nothing new. ‘Just breathe’ is nothing new. ‘Longer lasting reeds’ requires evidence. ‘Easier note bending due to airtight plastic comb’ is relative. ‘Thicker reed plate for consistent tone’ is inconsequential or requires supporting evidence. So you might argue there is little or nothing new about this harmonica. It’s just that Hohner has adopted pre-existing design features and manufactured them in a new combination. Here’s where it’s really at. Firstly instinct tells me this is an honest harmonica which actually is easy and pleasing to play compared with other budget models – including the Big River. Having broken open the packaging, octaving the appropriate reeds on the Blues Bender instantly gave well tuned and accurate unison without tremolo. Secondly, while marginally deeper than the hand made Marine Band from front to back, the Blues Bender is the same length end to end. In terms of size the two have much in common. 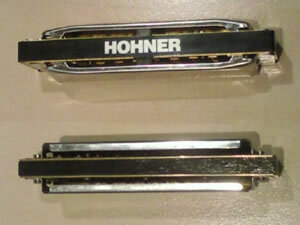 In both dimensions the Blues Bender is smaller than Hohner’s MS models. So it is more comfortable to hold and reminds me of the good old ‘pre MS’ days of harp playing. I much preferred the old spec. Clearly the biggest selling feature of the Blues Bender is the ratio between price and precision. Accompanying advertising at the Las Vegas Guitar Center indicated a RRP of $25.00, yet the store was selling them at $18.00 plus tax. That’s a fantastic deal, although I gather this arrangement is widespread across the USA. It currently equates to around £11.50 in Sterling. Which fills an important gap in the marketplace. 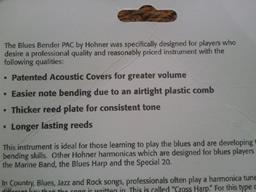 As the reverse side of the packaging states, ‘The Blues Bender PAC by Hohner was specifically designed for players who desire a professional quality and reasonably priced instrument.’ This is the bottom line. Forget the four unique selling points listed on the front. ‘This instrument is ideal for those learning to play.’ In short, if you are a beginner, you get a better standard of instrument for a limited outlay than, say, a Silver Star, Pocket Pal or GLH. And one that promotes accuracy and tone at that. Viva Las Vegas, Viva El Blues Blaster! Of greater consequence, I would venture to suggest, Hohner are now producing a harp that is cheaper than, and possibly superior to, it’s Big River Harp MS, if not its other MS harmonicas. Made in China? Who cares! This is a real step forward for credit crunch harmonica players. Just get rid of the end slots in the cover plates Hohner and you have yourselves the Ding Dong Daddy of new harps. Oh and you might want your marketeers to review their use of the term ‘bender’ before you launch it on the UK market. The Blues Bender is available in the keys of G, A, Bb, C, D, E and F and comes with its own protective hard case. For further views on this and other models, visit Pat Missin’s harmonica website here. An excellent review. I’ve held off looking at this instrument, but now perhaps I will. I have a harmonica teaching site in China, at http://www.kouqin.com.cn It’s a popular site, with around 40000 members. I sell Hohner Silver Stars as well as other models through the site. The Silver Stars are popular, the Blues Bender might be worth looking at. Thanks Tony. On first encounter I was sceptical. The blister packaging and blurb gave me the impression this might be a shoddy newcomer. Having curtailed my reactionary instincts and employed some impartial analysis however, I can honestly say this is a step forward for beginners. As an experienced player incidentally, I used my Blues Bender at a gig last weekend and it performed excellently. It had all the response I needed, a full tone and was very comfortable to play. That’s good value for money. Congratulations on your Chinese site by the way – I took a peek, but my linguistic skills stop this side of Swedish. It certainly looks like it’s stacked with good things and 40000 members is a real endorsement of your hard work. I loved your Harmonica World article this issue by the way. Using arpeggios this way really helps galvanise chord awareness and placement. It also promotes more imaginative movement around the harp. Always a good thing to think and play outside those comfort zones. I found your article so very interesting. The Hohner Blues Bend C is quite the same (may be exactly the same, may be the same chinese maker) of the Hohner International BluesBand. Take a Bluesband, disassembled it and compare with Blues Bender to realize. Thanks for your comment. There was a student a today’s Harp Surgery beginners workshop with an International. It looked similar as you say. If I get the chance to compare it next time I’ll get back to you. I realized that both, Blues Bender and BluesBand, are cheap copies of the Special 20, but not bad at all. I just started playing the harp and my first one I bought was the blues bender. I can hit all of the notes except 2 draw and its really bugging me. I can get all the others very easily. Is something wrong with the reed itself? I took it apart and watched a bunch of youtube tutorials on tuning the harp and tried tinkering with the 2 draw reed but nothing seems to work. I’m wondering if I’m the only one who has a problem with this particular model…because the guy at the music store I bought it from said this model may not produce all the notes at times. If the guy at the store told you what you say he told you, I confess I am shocked. He shouldn’t be selling a harp that’s not fit for purpose! Now at the time I reviewed the Blues Bender, I was satisfied that what was being manufactured was of a very good standard for a budget harmonica. There is a chance that you have bought a lemon, but I’ll bet you’ve got next to no chance of proving this to the store guy and getting a refund or a replacement. My advice is to buy another budget harp and see if you get the same problem with draw 2. In which case you simply need to develop the technique for getting a response from a reed which is notoriously elusive for beginners. Check out one of my early posts in which we look at draw 2 http://www.harpsurgery.com/why-is-draw-2-so-difficult/, try another harp and let me know how you get on. My golden melody finally gave up on me,and have just purchased a Blues Bender .I can honestly say i am well pleased with it,i am a beginer and i think it easy to play.A good buy. I bought 1 a couple of months ago and just ordered 4 more. I cannot believe how responsive and loud this harp is … especially at this price point. I find that the extra thick reed plate is a godsend, because I play in a … well, basically a metal band, and since I’m not playing through a Marshall half-stack, I would blow a ton of reeds (on Special 20s & Lee Oskars) overcompensating for the added volume and entensity. I also do a lot of long sustains and wails and the Blues Bender just feels so fluid when I’m screaming through it. It’s funny because when I saw that new blister pack, I instantly thought, “cheesy” … but I’m a believer now. I love your reviews man … very thorough and insightful. Yes thanks very much for this top notch review you left nothing out I like things in detail. I have a variety of harps and am a 8 month learner and have been thinking about getting B/Bender as I am entering the bends part of playing and doing OK but I find that it requires lots of practice and I think I will get a B/Bender and just see for my self. Will post my progress. Thanks Phil. Let us know how you get on. I just ordered a Blues Bender online. Thanks for the information but I do hope that your wrong Julio!!! I started playing a couple of years ago with a Blues Band and still have it. It was a decent harp to start with and shortly after I purchased a Marine Band harp. The Marine Band is light years better than the Blues Band but so is the price- $30 compared to $5. Now I’m looking at getting a complete set and at $30 a pop the Marine Band is going to be expensive. The other (and only) issue that I have with Marine Band is the wood comb. Its nice but is kind of rough on the lips whereas the plastic comb on the Blues Band doesn’t tear anything up. I will check the Blues Bender out when I get it and specifically compare it to my Blues Band. If its good I just may buy a complete set of them! It should be arriving in a few days. PS I saw an American made harmonica, the Bushman the other day at Sam Ash has anyone ever tried one? It was about the same price as the Marine Bands. Your implication is that “Just Breathe” is somehow specific to Bluesbender packaging. The truth is, Just breathe is Hohner’s company motto, slogan and/or part of their logo. Odd that you don’t seem to know that. Thanks Ricky. Are you in the USA…? I’ve been searching the web for days now trying to find a good quality/decently priced Hohner harp. I’ve been playing guitar for 13 yrs and these days I find myself with no one to jam with. I told a friend recently that I wish I could find someone who plays the fiddle or harmonica that could add some flavor to my singing and guitar playing. Suddenly it hit me that I used to play the harp when I was a kid and could probably pick it up again and learn to add my own solos (little “One Man Band” thing, you know?). Well, last time I bought a harp was probably mid to late 80’s. It was a Marine Band and I’m pretty sure I paid $10.95 for it. Now I go checking prices and I see that the MB is WAY out of my budget. Same with the Special 20 and Blues Harp. Any Hohner harp of good quality is gonna run more than I can spare and the cheap China versions are very inferior. I kept thinking, “If I could just find a good mid-grade in the $20 range I’d be happy”. This Blues Bender looks like the way to go for me. I can order one each payday, collect a set, and not break the bank doing it. Thanks for a good, informative, well written review! 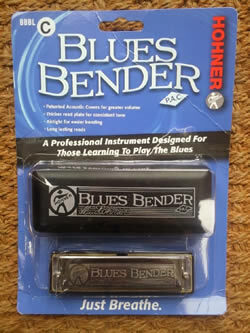 I just bought a set of three Blues Benders based on the information in your review. I wanted a set of Special 20s, but at $90 there’s just no way. I don’t like buying junk, but can’t afford top of the line. I’m really hoping this Blues Bender is a good comprimise. I also hope they are still as good quality as they were when you posted this review as I notice that you wrote it a couple yrs ago. Thanks for a good informative review! Oops, forgot I posted that first comment when I posted the second just now. Kinda makes the second a little redundant. Oh, well. Yay! Darrin you’re a gent. These really are great harps. I have mine on my desk right here and I love it! The harp that is. The bayliffs (repo men) can have the desk anytime! Hahahaha. I’ve got mine right here and she’s still panting…! These really are lovely harps. Very high on the Value For Money register. Go get yours Darrin. Now! Oh will you just sort it out Big D…. Hahahahaha just pulling your leg. Thanks for dropping by the Surgery again. Don’t be a stranger j’hear?!! Went to 2 music stores in the area today & neither sell harmonicas so I ordered a Hohner Blues Bender in C. Now I have to wait about 2 wks. for itto get here. Really enjoyed the review & comments. Makes me feel like I made a good choice…we’ll see. Bought my first one a week ago today. Great sound but hard for me to finish a song. It’s F#. I’m over 70 & loving the sound. Hi Ginny! I presume the song is in F# rather than the Bluesbender? What’s the song? Perhaps we can help steer you towards the best harp key for the job? Meantime thanks for reading our review.